I'm willing to bet that on an actual Medieval battlefield, this Star Wars inspired suit of armour may not be the most practical bit of kit. But just as a thing to look at? Well then yeah, holy crap, it looks downright incredible. The gorgeous piece of leatherwork was crafted by the fine folks over at Prince Armory, and is basically any alternate universe Star Wars fan's dream - the blend of traditional armour crafting techniques with a dash of elaborate medieval fantasy work perfectly for a character like Darth Vader, and especially so for the side of Star Wars that has always leaned a little closer to sci-fantasy than it has traditional sci-fi. 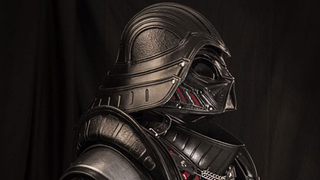 There's so many gorgeous bits of detailing all over the suit - the gorgeously creepy facemask, the red highlights over the chestpiece and gauntlets, and the shoulder armour/gorget section forming the armour that Vader wore in the movies himself. Hell, it might only be tanned leather, but this Vader is probably far more armoured than the original version was! Check out a brief video of the helmet itself below, but if you want to see more behind the scenes goodness of this gorgeous Sith Lord, you can check it out at the link here.